” Monrovia-Liberia-West Africa, January 27, 2011 After two wars over two decades in Liberia, the country is still trying to find a new pathway towards the wellbeing of its people. 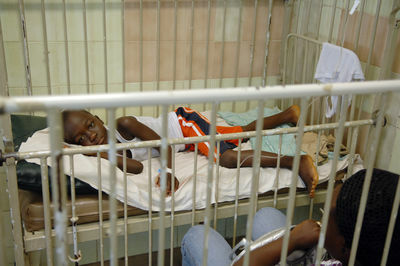 A small 141 bed hospital, known in West Africa for its pediatric surgery department and as “THE HEROES WITHOUT BORDERS HOSPITAL”, has become the main reference platform for the people suffering in Liberia including foreign refugees from Ivory Coast and Sierra Leone; the St. Joseph Catholic Hospital in Monrovia, established in 1963 by the Hospitaller Order of the Brothers of St. John of God. In synchronicity, and for almost a decade ”POR AFRICA”, a small Spanish NGO fully dedicated to the children’s’ welfare, is working in collaboration trying to provide the finest in healthcare. The very small team of Spanish doctors is known by the affectionate moniker of “HEROES WITHOUT BORDERS”. 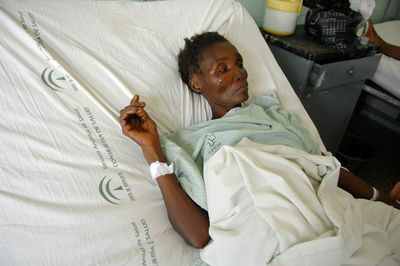 In the picture, a woman waiting interferon therapy, as victim of the HIV-Aids. ” Monrovia-Liberia-West Africa, January 27, 2011 After two wars over two decades in Liberia, the country is still trying to find a new pathway towards the wellbeing of its people. A small 141 bed hospital, known in West Africa for its pediatric surgery department and as “THE HEROES WITHOUT BORDERS HOSPITAL”, has become the main reference platform for the people suffering in Liberia including foreign refugees from Ivory Coast and Sierra Leone; the St. Joseph Catholic Hospital in Monrovia, established in 1963 by the Hospitaller Order of the Brothers of St. John of God. 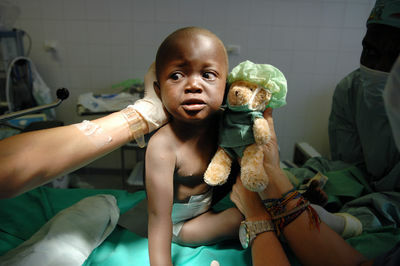 In synchronicity, and for almost a decade ”POR AFRICA”, a small Spanish NGO fully dedicated to the children’s’ welfare, is working in collaboration trying to provide the finest in healthcare. The very small team of Spanish doctors is known by the affectionate moniker of “HEROES WITHOUT BORDERS”. 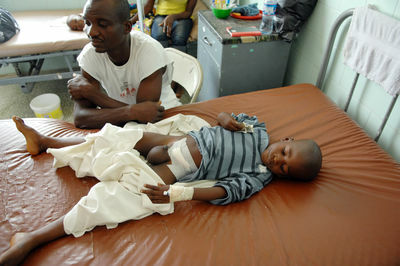 In the picture, a child is recuperating his health conditions, looked after by his father, after an umbilical hernia surgery. ” Monrovia-Liberia-West Africa, January 27, 2011 After two wars over two decades in Liberia, the country is still trying to find a new pathway towards the wellbeing of its people. A small 141 bed hospital, known in West Africa for its pediatric surgery department and as “THE HEROES WITHOUT BORDERS HOSPITAL”, has become the main reference platform for the people suffering in Liberia including foreign refugees from Ivory Coast and Sierra Leone; the St. Joseph Catholic Hospital in Monrovia, established in 1963 by the Hospitaller Order of the Brothers of St. John of God. In synchronicity, and for almost a decade ”POR AFRICA”, a small Spanish NGO fully dedicated to the children’s’ welfare, is working in collaboration trying to provide the finest in healthcare. 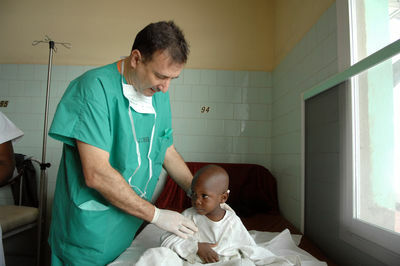 The very small team of Spanish doctors is known by the affectionate moniker of “HEROES WITHOUT BORDERS”. 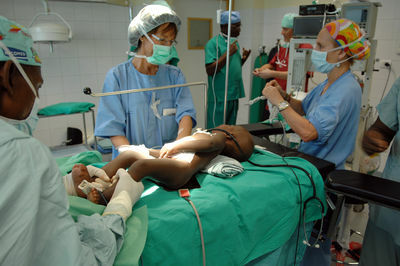 In the picture, two spanish doctor, are taking care of a baby girl after having perform on her a intestine surgery. ” Monrovia-Liberia-West Africa, January 27, 2011 After two wars over two decades in Liberia, the country is still trying to find a new pathway towards the wellbeing of its people. A small 141 bed hospital, known in West Africa for its pediatric surgery department and as “THE HEROES WITHOUT BORDERS HOSPITAL”, has become the main reference platform for the people suffering in Liberia including foreign refugees from Ivory Coast and Sierra Leone; the St. Joseph Catholic Hospital in Monrovia, established in 1963 by the Hospitaller Order of the Brothers of St. John of God. In synchronicity, and for almost a decade ”POR AFRICA”, a small Spanish NGO fully dedicated to the children’s’ welfare, is working in collaboration trying to provide the finest in healthcare. The very small team of Spanish doctors is known by the affectionate moniker of “HEROES WITHOUT BORDERS”. In the picture, a spanish doctor, is taking care of a child, seriously affected by the Dracunculus Medinensis, also known as Guinea worm disease,that is caused by the large female nematode, Dracunculus Medinensis, which is among the longest nematodes infecting humans. The adult female is primarily larger than the adult male. Mature female worms migrate along subcutaneous tissues to reach the skin below the knee, forming a painful ulcerating blister. They can also emerge from other parts of the body, such as the head, torso, upper extremities, buttocks, and genitalia. A person gets infected, by drinking water from stagnant sources (e.g., ponds) contaminated with copepods containing immature forms of the parasite (juveniles), which have been previously released from the skin of a definitive host. The infection can also be acquired by eating a fish paratenic host, but this is rare. The parasite is known to be found mostly in some West-African countries . ” Monrovia-Liberia-West Africa, January 27, 2011 After two wars over two decades in Liberia, the country is still trying to find a new pathway towards the wellbeing of its people. A small 141 bed hospital, known in West Africa for its pediatric surgery department and as “THE HEROES WITHOUT BORDERS HOSPITAL”, has become the main reference platform for the people suffering in Liberia including foreign refugees from Ivory Coast and Sierra Leone; the St. Joseph Catholic Hospital in Monrovia, established in 1963 by the Hospitaller Order of the Brothers of St. John of God. In synchronicity, and for almost a decade ”POR AFRICA”, a small Spanish NGO fully dedicated to the children’s’ welfare, is working in collaboration trying to provide the finest in healthcare. The very small team of Spanish doctors is known by the affectionate moniker of “HEROES WITHOUT BORDERS”. 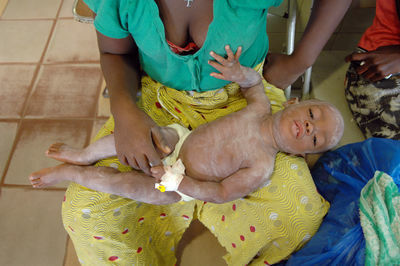 In the picture, a baby boy under malaria treatment. ” Monrovia-Liberia-West Africa, January 27, 2011 After two wars over two decades in Liberia, the country is still trying to find a new pathway towards the wellbeing of its people. A small 141 bed hospital, known in West Africa for its pediatric surgery department and as “THE HEROES WITHOUT BORDERS HOSPITAL”, has become the main reference platform for the people suffering in Liberia including foreign refugees from Ivory Coast and Sierra Leone; the St. Joseph Catholic Hospital in Monrovia, established in 1963 by the Hospitaller Order of the Brothers of St. John of God. In synchronicity, and for almost a decade ”POR AFRICA”, a small Spanish NGO fully dedicated to the children’s’ welfare, is working in collaboration trying to provide the finest in healthcare. The very small team of Spanish doctors is known by the affectionate moniker of “HEROES WITHOUT BORDERS”. 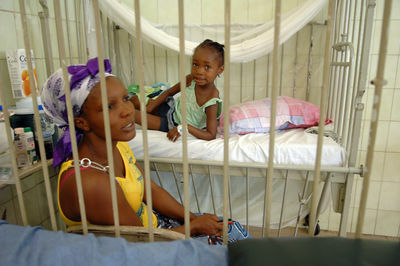 In the picture, a young mother, taking care of her child during the malaria treatment. ” Monrovia-Liberia-West Africa, January 27, 2011 After two wars over two decades in Liberia, the country is still trying to find a new pathway towards the wellbeing of its people. 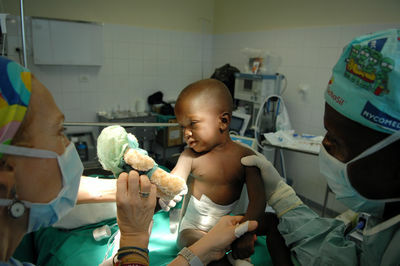 A small 141 bed hospital, known in West Africa for its pediatric surgery department and as “THE HEROES WITHOUT BORDERS HOSPITAL”, has become the main reference platform for the people suffering in Liberia including foreign refugees from Ivory Coast; the St. Joseph Catholic Hospital in Monrovia, established in 1963 by the Hospitaller Order of the Brothers of St. John of God. 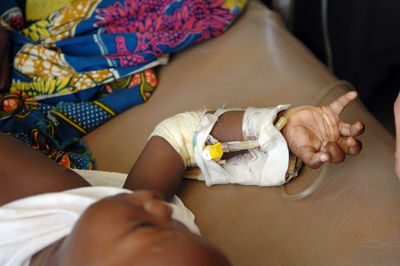 In synchronicity, and for almost a decade ”POR AFRICA”, a small Spanish NGO fully dedicated to the children’s’ welfare, is working in collaboration trying to provide the finest in healthcare. The very small team of Spanish doctors is known by the affectionate moniker of “HEROES WITHOUT BORDERS”. 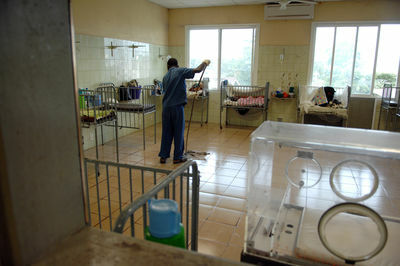 In the picture, a personnel of the St'John's of God Hospital of Monrovia, is cleaning the pediatric ward. ” Monrovia-Liberia-West Africa, January 27, 2011 After two wars over two decades in Liberia, the country is still trying to find a new pathway towards the wellbeing of its people. 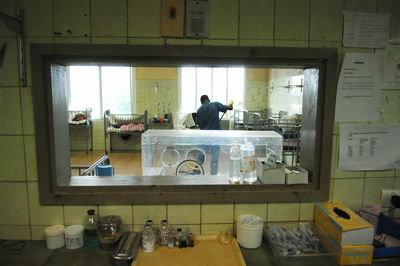 A small 141 bed hospital, known in West Africa for its pediatric surgery department and as “THE HEROES WITHOUT BORDERS HOSPITAL”, has become the main reference platform for the people suffering in Liberia including foreign refugees from Ivory Coast and Sierra Leone; the St. Joseph Catholic Hospital in Monrovia, established in 1963 by the Hospitaller Order of the Brothers of St. John of God. In synchronicity, and for almost a decade ”POR AFRICA”, a small Spanish NGO fully dedicated to the children’s’ welfare, is working in collaboration trying to provide the finest in healthcare. The very small team of Spanish doctors is known by the affectionate moniker of “HEROES WITHOUT BORDERS”. In the picture, a spanish doctor, is taking care of a woman, seriously affected by the Dracunculus Medinensis, also known as Guinea worm disease,that is caused by the large female nematode, Dracunculus Medinensis, which is among the longest nematodes infecting humans. The adult female is primarily larger than the adult male. Mature female worms migrate along subcutaneous tissues to reach the skin below the knee, forming a painful ulcerating blister. They can also emerge from other parts of the body, such as the head, torso, upper extremities, buttocks, and genitalia. A person gets infected, by drinking water from stagnant sources (e.g., ponds) contaminated with copepods containing immature forms of the parasite (juveniles), which have been previously released from the skin of a definitive host. The infection can also be acquired by eating a fish paratenic host, but this is rare. The parasite is known to be found mostly in some West-African countries . ” Monrovia-Liberia-West Africa, January 27, 2011 After two wars over two decades in Liberia, the country is still trying to find a new pathway towards the wellbeing of its people. A small 141 bed hospital, known in West Africa for its pediatric surgery department and as “THE HEROES WITHOUT BORDERS HOSPITAL”, has become the main reference platform for the people suffering in Liberia including foreign refugees from Ivory Coast and Sierra Leone; the St. Joseph Catholic Hospital in Monrovia, established in 1963 by the Hospitaller Order of the Brothers of St. John of God. In synchronicity, and for almost a decade ”POR AFRICA”, a small Spanish NGO fully dedicated to the children’s’ welfare, is working in collaboration trying to provide the finest in healthcare. The very small team of Spanish doctors is known by the affectionate moniker of “HEROES WITHOUT BORDERS”. In the picture, a spanish doctor, a little baby, seriously affected by the Dracunculus Medinensis, also known as Guinea worm disease,that is caused by the large female nematode, Dracunculus Medinensis, which is among the longest nematodes infecting humans. The adult female is primarily larger than the adult male. Mature female worms migrate along subcutaneous tissues to reach the skin below the knee, forming a painful ulcerating blister. They can also emerge from other parts of the body, such as the head, torso, upper extremities, buttocks, and genitalia. A person gets infected, by drinking water from stagnant sources (e.g., ponds) contaminated with copepods containing immature forms of the parasite (juveniles), which have been previously released from the skin of a definitive host. The infection can also be acquired by eating a fish paratenic host, but this is rare. The parasite is known to be found mostly in some west-african countries . ” Monrovia-Liberia-West Africa, January 27, 2011 After two wars over two decades in Liberia, the country is still trying to find a new pathway towards the wellbeing of its people. 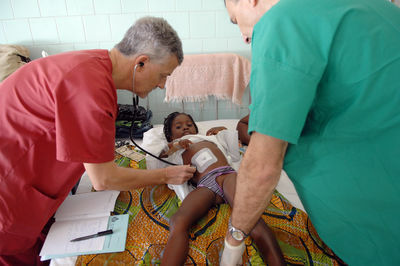 A small 141 bed hospital, known in West Africa for its pediatric surgery department and as “THE HEROES WITHOUT BORDERS HOSPITAL”, has become the main reference platform for the people suffering in Liberia including foreign refugees from Ivory Coast and Sierra Leone; the St. Joseph Catholic Hospital in Monrovia, established in 1963 by the Hospitaller Order of the Brothers of St. John of God. In synchronicity, and for almost a decade ”POR AFRICA”, a small Spanish NGO fully dedicated to the children’s’ welfare, is working in collaboration trying to provide the finest in healthcare. The very small team of Spanish doctors is known by the affectionate moniker of “HEROES WITHOUT BORDERS”. 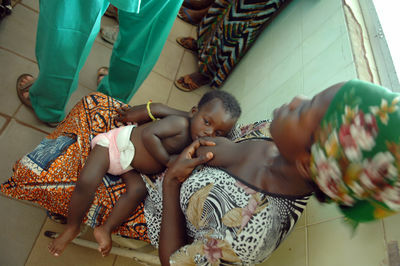 In the picture, a young mother, is holding her little baby, seriously affected by the Dracunculus Medinensis, also known as Guinea worm disease,that is caused by the large female nematode, Dracunculus Medinensis, which is among the longest nematodes infecting humans. The adult female is primarily larger than the adult male. Mature female worms migrate along subcutaneous tissues to reach the skin below the knee, forming a painful ulcerating blister. They can also emerge from other parts of the body, such as the head, torso, upper extremities, buttocks, and genitalia. A person gets infected, by drinking water from stagnant sources (e.g., ponds) contaminated with copepods containing immature forms of the parasite (juveniles), which have been previously released from the skin of a definitive host. The infection can also be acquired by eating a fish paratenic host, but this is rare. The parasite is known to be found mostly in some west-african countries . ” Monrovia-Liberia-West Africa, January 27, 2011 After two wars over two decades in Liberia, the country is still trying to find a new pathway towards the wellbeing of its people. A small 141 bed hospital, known in West Africa for its pediatric surgery department and as “THE HEROES WITHOUT BORDERS HOSPITAL”, has become the main reference platform for the people suffering in Liberia including foreign refugees from Ivory Coast and Sierra Leone; the St. Joseph Catholic Hospital in Monrovia, established in 1963 by the Hospitaller Order of the Brothers of St. John of God. In synchronicity, and for almost a decade ”POR AFRICA”, a small Spanish NGO fully dedicated to the children’s’ welfare, is working in collaboration trying to provide the finest in healthcare. The very small team of Spanish doctors is known by the affectionate moniker of “HEROES WITHOUT BORDERS”. 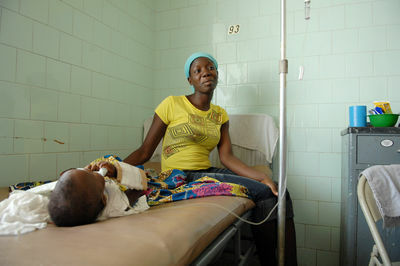 In the picture, a young mother, is looking after at her daughter, seriously affected by the Dracunculus Medinensis, also known as Guinea worm disease,that is caused by the large female nematode, Dracunculus Medinensis, which is among the longest nematodes infecting humans. The adult female is primarily larger than the adult male. Mature female worms migrate along subcutaneous tissues to reach the skin below the knee, forming a painful ulcerating blister. They can also emerge from other parts of the body, such as the head, torso, upper extremities, buttocks, and genitalia. A person gets infected, by drinking water from stagnant sources (e.g., ponds) contaminated with copepods containing immature forms of the parasite (juveniles), which have been previously released from the skin of a definitive host. The infection can also be acquired by eating a fish paratenic host, but this is rare. The parasite is known to be found mostly in some West-African countries . ” Monrovia-Liberia-West Africa, January 27, 2011 After two wars over two decades in Liberia, the country is still trying to find a new pathway towards the wellbeing of its people. A small 141 bed hospital, known in West Africa for its pediatric surgery department and as “THE HEROES WITHOUT BORDERS HOSPITAL”, has become the main reference platform for the people suffering in Liberia including foreign refugees from Ivory Coast and Sierra Leone; the St. Joseph Catholic Hospital in Monrovia, established in 1963 by the Hospitaller Order of the Brothers of St. John of God. In synchronicity, and for almost a decade ”POR AFRICA”, a small Spanish NGO fully dedicated to the children’s’ welfare, is working in collaboration trying to provide the finest in healthcare. The very small team of Spanish doctors is known by the affectionate moniker of “HEROES WITHOUT BORDERS”. 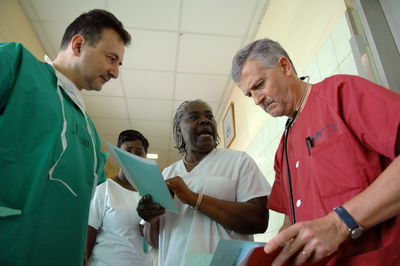 In the picture, two spanish doctors are briefing the nurses, before starting their daily assignment. ” Monrovia-Liberia-West Africa, January 27, 2011 After two wars over two decades in Liberia, the country is still trying to find a new pathway towards the wellbeing of its people. 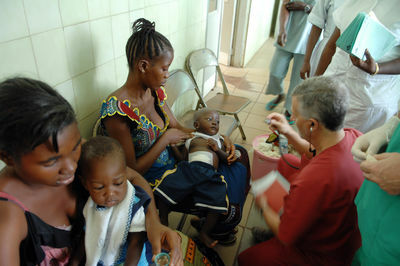 A small 141 bed hospital, known in West Africa for its pediatric surgery department and as “THE HEROES WITHOUT BORDERS HOSPITAL”, has become the main reference platform for the people suffering in Liberia including foreign refugees from Ivory Coast and Sierra Leone; the St. Joseph Catholic Hospital in Monrovia, established in 1963 by the Hospitaller Order of the Brothers of St. John of God. In synchronicity, and for almost a decade ”POR AFRICA”, a small Spanish NGO fully dedicated to the children’s’ welfare, is working in collaboration trying to provide the finest in healthcare. The very small team of Spanish doctors is known by the affectionate moniker of “HEROES WITHOUT BORDERS”. 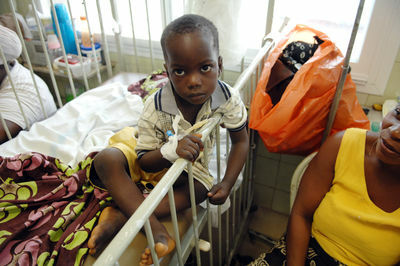 In the picture, a young boy, is waiting doctors for a check, as he is seriously affected by the Dracunculus Medinensis, also known as Guinea worm disease,that is caused by the large female nematode, Dracunculus Medinensis, which is among the longest nematodes infecting humans. The adult female is primarily larger than the adult male. Mature female worms migrate along subcutaneous tissues to reach the skin below the knee, forming a painful ulcerating blister. They can also emerge from other parts of the body, such as the head, torso, upper extremities, buttocks, and genitalia. A person gets infected, by drinking water from stagnant sources (e.g., ponds) contaminated with copepods containing immature forms of the parasite (juveniles), which have been previously released from the skin of a definitive host. The infection can also be acquired by eating a fish paratenic host, but this is rare. The parasite is known to be found mostly in some West-African countries . ” Monrovia-Liberia-West Africa, January 27, 2011 After two wars over two decades in Liberia, the country is still trying to find a new pathway towards the wellbeing of its people. A small 141 bed hospital, known in West Africa for its pediatric surgery department and as “THE HEROES WITHOUT BORDERS HOSPITAL”, has become the main reference platform for the people suffering in Liberia including foreign refugees from Ivory Coast and Sierra Leone; the St. Joseph Catholic Hospital in Monrovia, established in 1963 by the Hospitaller Order of the Brothers of St. John of God. In synchronicity, and for almost a decade ”POR AFRICA”, a small Spanish NGO fully dedicated to the children’s’ welfare, is working in collaboration trying to provide the finest in healthcare. The very small team of Spanish doctors is known by the affectionate moniker of “HEROES WITHOUT BORDERS”. 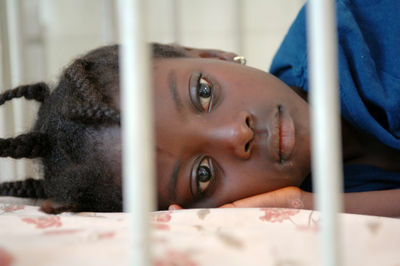 In the picture, a child refugee from Ivory Coast, is under treatment for malaria. ” Monrovia-Liberia-West Africa, January 27, 2011 After two wars over two decades in Liberia, the country is still trying to find a new pathway towards the wellbeing of its people. 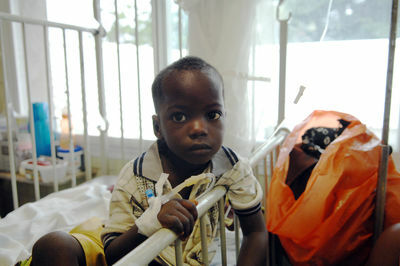 A small 141 bed hospital, known in West Africa for its pediatric surgery department and as “THE HEROES WITHOUT BORDERS HOSPITAL”, has become the main reference platform for the people suffering in Liberia including foreign refugees from Ivory Coast and Sierra Leone; the St. Joseph Catholic Hospital in Monrovia, established in 1963 by the Hospitaller Order of the Brothers of St. John of God. In synchronicity, and for almost a decade ”POR AFRICA”, a small Spanish NGO fully dedicated to the children’s’ welfare, is working in collaboration trying to provide the finest in healthcare. The very small team of Spanish doctors is known by the affectionate moniker of “HEROES WITHOUT BORDERS”. 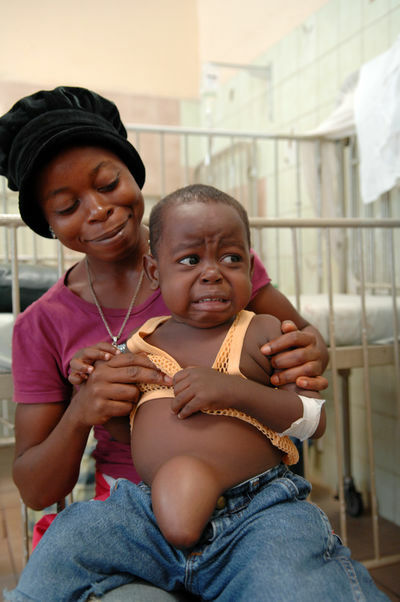 In the picture, a mother is holding her child, seriously affected by the Dracunculus Medinensis, also known as Guinea worm disease,that is caused by the large female nematode, Dracunculus Medinensis, which is among the longest nematodes infecting humans. The adult female is primarily larger than the adult male. Mature female worms migrate along subcutaneous tissues to reach the skin below the knee, forming a painful ulcerating blister. They can also emerge from other parts of the body, such as the head, torso, upper extremities, buttocks, and genitalia. A person gets infected, by drinking water from stagnant sources (e.g., ponds) contaminated with copepods containing immature forms of the parasite (juveniles), which have been previously released from the skin of a definitive host. The infection can also be acquired by eating a fish paratenic host, but this is rare. The parasite is known to be found mostly in some West-African countries . ” Monrovia-Liberia-West Africa, January 27, 2011 After two wars over two decades in Liberia, the country is still trying to find a new pathway towards the wellbeing of its people. A small 141 bed hospital, known in West Africa for its pediatric surgery department and as “THE HEROES WITHOUT BORDERS HOSPITAL”, has become the main reference platform for the people suffering in Liberia including foreign refugees from Ivory Coast and Sierra Leone; the St. Joseph Catholic Hospital in Monrovia, established in 1963 by the Hospitaller Order of the Brothers of St. John of God. In synchronicity, and for almost a decade ”POR AFRICA”, a small Spanish NGO fully dedicated to the children’s’ welfare, is working in collaboration trying to provide the finest in healthcare. The very small team of Spanish doctors is known by the affectionate moniker of “HEROES WITHOUT BORDERS”. 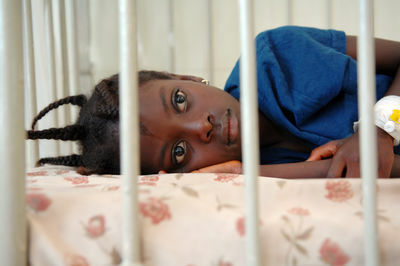 In the picture, Fatimah Abdullahid, eleven years old, is resting after fleeing the violence in Ivory Coast, her home country. She has been diagnosed with the PTSD, the Post Traumatic Stress Disorder. ” Monrovia-Liberia-West Africa, January 27, 2011 After two wars over two decades in Liberia, the country is still trying to find a new pathway towards the wellbeing of its people. A small 141 bed hospital, known in West Africa for its pediatric surgery department and as “THE HEROES WITHOUT BORDERS HOSPITAL”, has become the main reference platform for the people suffering in Liberia including foreign refugees from Ivory Coast and Sierra Leone; the St. Joseph Catholic Hospital in Monrovia, established in 1963 by the Hospitaller Order of the Brothers of St. John of God. In synchronicity, and for almost a decade ”POR AFRICA”, a small Spanish NGO fully dedicated to the children’s’ welfare, is working in collaboration trying to provide the finest in healthcare. The very small team of Spanish doctors is known by the affectionate moniker of “HEROES WITHOUT BORDERS”. In the picture, a spanish doctor, is taking care of a little baby, seriously affected by the Dracunculus Medinensis, also known as Guinea worm disease,that is caused by the large female nematode, Dracunculus Medinensis, which is among the longest nematodes infecting humans. The adult female is primarily larger than the adult male. Mature female worms migrate along subcutaneous tissues to reach the skin below the knee, forming a painful ulcerating blister. They can also emerge from other parts of the body, such as the head, torso, upper extremities, buttocks, and genitalia. A person gets infected, by drinking water from stagnant sources (e.g., ponds) contaminated with copepods containing immature forms of the parasite (juveniles), which have been previously released from the skin of a definitive host. The infection can also be acquired by eating a fish paratenic host, but this is rare. 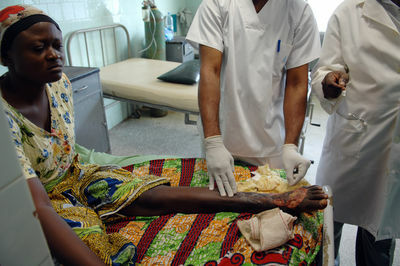 The parasite is known to be found mostly in some West-African countries . ” Monrovia-Liberia-West Africa, January 27, 2011 After two wars over two decades in Liberia, the country is still trying to find a new pathway towards the wellbeing of its people. 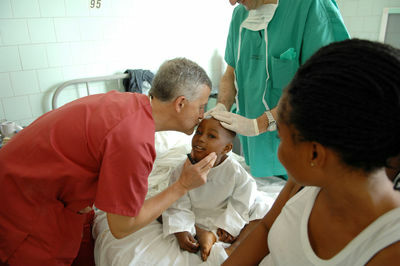 A small 141 bed hospital, known in West Africa for its pediatric surgery department and as “THE HEROES WITHOUT BORDERS HOSPITAL”, has become the main reference platform for the people suffering in Liberia including foreign refugees from Ivory Coast; the St. Joseph Catholic Hospital in Monrovia, established in 1963 by the Hospitaller Order of the Brothers of St. John of God. In synchronicity, and for almost a decade ”POR AFRICA”, a small Spanish NGO fully dedicated to the children’s’ welfare, is working in collaboration trying to provide the finest in healthcare. The very small team of Spanish doctors is known by the affectionate moniker of “HEROES WITHOUT BORDERS”.In the picture, baby Ismahel waking up from an umbelical surgery after been seriously affected, is reborn to a new life.